Anytime someone makes a spelling and punctuation error in public, particularly on materials printed professionally, it’s funny. For instance, on the South Mountain rest areas on both sides of I-70 in Maryland, a sign indicates where “RV’s” should go. It should read “RVs”, since it is neither possessive nor a contraction for “RV is”. 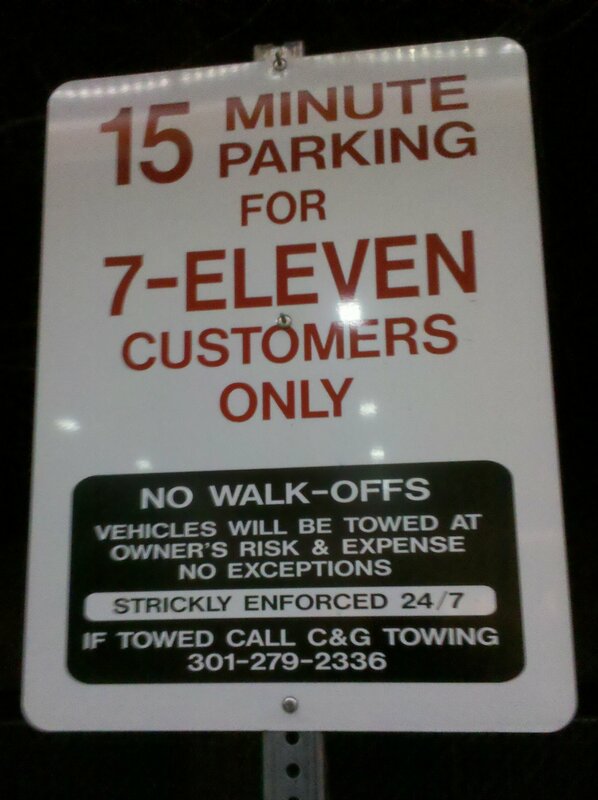 In English, we don’t add apostrophes when pluralizing. One can correctly write, “The apostrophe’s going to be placed here,” or “The apostrophe’s tail is beautiful,” but one cannot correctly write, “I am putting six apostrophe’s in the sentence.” That would be correctly written as “I am putting six apostrophes in the sentence.” If you want to really get on my nerves, just be sloppy with your apostrophes. It drives me crazy. People need to boycott WASH-FM until after New Years when they stop playing that annoying #Christmas music! After all, “#Christmas” is really just a celebration of #capitalism and materialism, and anyone who thinks otherwise is deluding themselves. How much would I have to pay the man playing #Christmas music on his trumpet to get him to stop? Why don’t we just refer to #Christmas as “Shameless #Capitalism Day” and get it over with already? Happy Generic Capitalist Holiday to all. So I saw a chiropractor today for some neck and lower back pain that I’d been having lately. I chose to see a chiropractor as opposed to a regular doctor because of a couple of matters that happened some years ago. 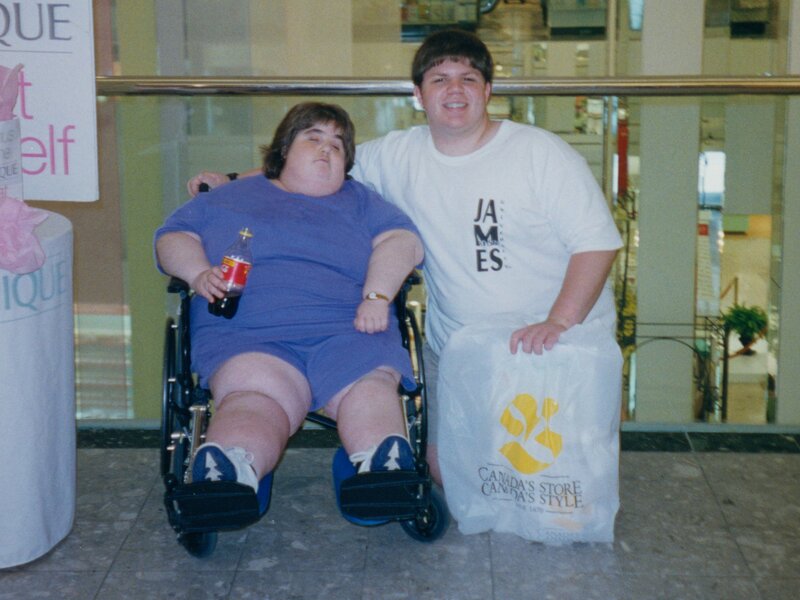 In the summer of 2001, I had a bout with some pretty severe lower back pain. I saw a regular doctor about it, and they prescribed muscle relaxers, which did nothing except cost money. Then one day in March 2002, after months of the back pain coming and going, I sat down on my couch in my old Potomac Hall dorm room, and… *pop* – instant relief. The pain was completely gone. I don’t think I had felt that good in a long time. Went from about a six on the 1-10 pain scale to ahhhhh in one short second. So when my neck started feeling a little stiff a few months ago, as well as some lower back stiffness when standing for extended periods (like at demonstrations and such), remembering that feeling of relief from a while back, I started doing some research on chiropractic. I read up about what it entailed and what it was about, and also went on Quackwatch to see what kinds of red flags to look out for. I read plenty of horror stories about chiropractors who did way more adjustments on people than were necessary, who routinely x-rayed when it wasn’t necessary, and pressured patients with a lot of hard-selling. So having done a whole lot of research on what to look for and what to look for as warning signs, I started looking for chiropractors in the Wheaton area. Ultimately, it came down to Dr. Peter McPartland and Wheaton Chiropractic. Both facilities took my insurance. While McPartland was closer to my house and within walking distance of Glenmont station, I ultimately chose Wheaton Chiropractic for a few reasons. First of all, McPartland was a storefront office at Glenmont Shopping Center, while Wheaton Chiropractic was in a medical office building (Forest Glen Medical Center). Then on McPartland’s new-patient forms, which were available for download, I read this passage: “This is to certify that I am not pregnant and Dr. Peter McPartland or Staff has my permission to take x-rays of me.” Compare to Wheaton Chiropractic, which said, “Current research does not support routine imaging, especially for uncomplicated cases. We are conservative about ordering studies for patients, and will order them only when clinically indicated.” That was the grabber there – one asked for blanket permission up front to x-ray, and the other one said they wouldn’t x-ray at all unless it was really necessary. So I went with Wheaton Chiropractic. 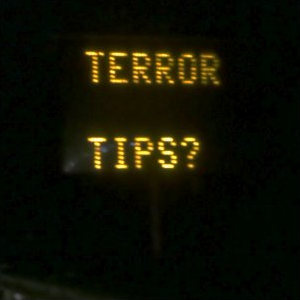 Basically, the sign encourages people to report “terror tips” to the authorities at the aforementioned number. 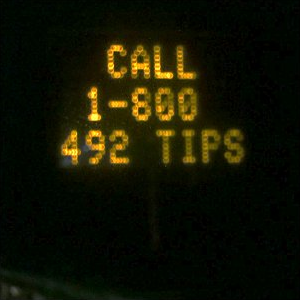 A little research indicates that the number goes to the Maryland Coordination and Analysis Center, a state counter-terrorism agency. If this is how Metro is going to spend our money, then I want my fare increase back. So Metro really thinks that security theater will make us safer? Really? Didn’t we like just discuss this a couple of years ago? I still firmly stand by what I said two years ago, and that is that it’s a waste of time and money. Word to the wise: Don’t drop your Droid on its head. Those of you who follow me on the Twitter know when I’m riding Metro. After all, during those times, many of my tweets have the #wmata hashtag on them. And usually, one Metro ride in a day is followed later in the day by another (after all, after going somewhere, I usually have to go back). But on Friday evening, I was notably silent. See, I had broken my Droid. What happened is that I had just gotten off the phone with Mom. I usually call my mother during the walk from the office to Dupont Circle station, and we stay on the phone while I go down into the station and wait on the platform, only saying goodbye once I’m safely on the train (there’s a dead spot in the tunnel between Dupont Circle and Farragut North, so we have to end it by then). This particular evening, Mom had to get off the phone early, because Dad had dinner ready and she had to go. So we said goodbye while I was still waiting on the platform, and got off the phone. Once I get off the phone, I usually switch to my iPod and resume my Randi Rhodes podcast. So I tucked the phone under my chin and held it against my chest with my chin. However, my winter coat, zipped all the way up, got in the way, though I didn’t realize it at the time. So while I was pulling out my iPod and my headphones, the phone dropped from where I was holding it, and landed headfirst on the platform. If you’re holding it upright, the top of it is what struck the platform, and it hit with enough force to knock the snap-on case off of it. I picked the phone up, and to my surprise, the screen was black. So I’m a little bit annoyed. Yesterday afternoon marks the second time I’ve missed a fire alarm at work on account of being out to lunch. Let’s admit it – building evacuations on account of a fire alarm of unknown cause are kind of exciting. First there’s the system aspect of it. The Wheelock NS horn/strobes and Wheelock RSS strobes in my office building come to life, and start making a Code-3 pattern and start flashing. That right there is always cool, since these devices are, for the vast majority of the time, silent fixtures on the wall, which I’m sure many forget about. But then there’s the other part of things, and that’s where a little suspense and excitement comes in. The building might actually be on fire! After all, if you don’t get out quickly, the fire might get you, and no one wants that. And as mentioned, this is the second time in a row that the fire alarm has gone off this year that I’ve missed. And for anyone to miss it, it would be me. I’m just the person with the Wheelock 7002T on his desk, after all. Both times were during what we call “Schumy Lunch”, which is where a bunch of us go out on Fridays to have lunch. The first time was in August, and we were out at Logan Tavern, about two blocks away from the office. We saw a fire truck go by during lunch and didn’t think anything about it, until I got a text message during lunch. Turns out that hey, the fire alarm went off. Put two and two together, and aha – that fire truck was headed to our building! As I understand it, it was an accidental alarm caused by maintenance work. It happens, I suppose. Then this one on Friday was caused by construction work. They’re renovating the small fitness center that’s in our building, and, well, they presumably tripped a smoke head. Oops. We got back from Schumy Lunch at Chipotle in Dupont Circle, found out coming in that we missed a fire alarm by about ten minutes, and found out what the source of the alarm was. My first reaction was being annoyed that I missed another one, and commenting that they need to stop accidentally setting off the alarm while I’m out of the building (and waiting to do it when I’m around). Then I suggested, in jest, “Can I just pull the alarm so we can do the evacuation with me?” They said no, and I was like, “Darn!” in that I-knew-that-was-going-to-be-the-answer kind of way. So did you ever wonder how much I talk about what in this space? Well, I did, and so I sat down with a pen and paper and categorized my Journal entries. Seriously. I did every Journal entry starting with this entry at the beginning of 2009 about an Augusta County issue, all the way through this entry, which I remember most for composing it on the Metro. And what did I find out? Well, it’s kind of surprising and not surprising. Not surprising is that the thing I discussed most in the past almost-two-years is Metro – 38 times. Surprising, however, is that discussion of Anonymous is so close to it – 33 times. In 2009, I actually discussed Anonymous more times than Metro by one (24 Anon vs. 23 Metro), and then it reversed to more what I would have expected in 2010 (15 Metro and 9 Anon). Then after that, I discuss work – 24 times since the beginning of 2009. I wasn’t really surprised about that. But you know what was really surprising? Since January 1, 2009, I wrote about snow 19 times, making it the topic I discuss fifth most often overall. I guess that’s what happens when nature dumps a few feet of snow on the Washington DC area and we’re all trapped in our houses for days at a time. I racked up most of those hits during the blizzards last winter, and in February 2010, that’s just about all I talked about. See, we did our annual office trivia contest on Friday, in the usual format. The way that works is that I ask a question, and the first person to get it right wins a prize, which comes from whatever freebie stuff we get over the course of the year. The topics are something I pick. In 2008, it was United States Presidents. In 2009, it was United States geography. In 2010, after complaints that I made the geography questions too easy, I went for something a little harder, yet something that people around here should know more about than they do: the Metro. Thus why I pulled out the safety vest. After all, if one is going to do a trivia contest about Metro, one should at least look the part. 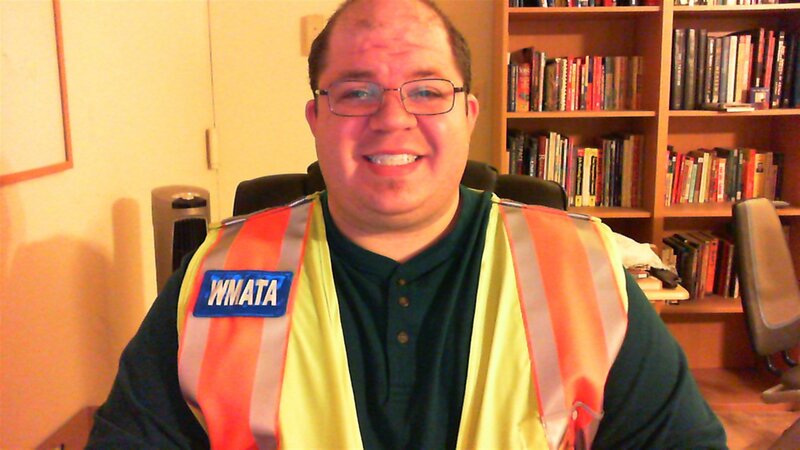 Thus I wore my WMATA safety vest at work when I hosted trivia.